As Russia slides into recession Kyrgyzstan and Tajikistan face sharp falls in migrant remittances. One of the most worrisome and under-discussed issues surrounding Russia’s collapse into recession is the impact the economic retrenchment will have on the migrant laborers currently working as help throughout the country. With the second-largest immigrant population in the world, Russia’s migrant laborers will be among the population sets quickest to feel the pinch of economic contraction. And while there may be some time before the nations of origin see a concomitant impact, the ripples have already begun. Tajikistan and Kyrgyzstan have long relied heavily on the remittances sent by those of their nationals braving discrimination and language difficulties to work in Russia. Both still stand among the most reliant in the world on inbound remittances, with Tajikistan regularly taking the top position worldwide. But as the Russian economy falters, and as construction and service industries begin stalling, Tajikistan’s remittance rate has begun tumbling – fast. Earlier this year, the World Bank reported that remittances provided over 50 percent of Tajikistan’s GDP. According to numbers posted in October, however, that number has tumbled nearly 20 percent in just a few months – before Russia officially entered recession, and even as overall remittances to developing countries were up 5 percent worldwide. While Kyrgyzstan’s rate has remained largely steady, anecdotal evidence suggests that remittances to villages are beginning to run dry. And as should now be obvious, Russian President Vladimir Putin’s apparent lack of economic salience – and his willingness to forego any meaningful macroeconomic shift, in the face of his country’s fractured economic model – means such trends will only continue through the next year. This marked decline in remittance rate presents a wealth of reverberations beyond simple top-level numbers. Foremost, Kyrgyzstan and Tajikistan will suddenly see the most significant pillars of their GDP weakened. Jobs will disappear. Savings will shrink. Few will be immune from the downturn. As one Tajik mother, one of the millions of Tajikistan nationals with a family member working in Russia, recently said, “My son was ruined.” Part of the reason these millions of Tajikistan and Kyrgyzstan nationals have opted to work in Russia, of course, lies in the fact that there’s little worthwhile work to be found in their home countries. A lack of localized industry – to say nothing of the rampant corruption coursing through business structures in both countries, cutting what little revenue can be found – drove millions northward. Now, those without work will face a stark choice: Remain, and attempt to weather a recession that shows little sign of ceasing in the short- or mid-term, or leave and attempt to locate what work they can find elsewhere. According to Mukhammed Amin, the head of the Federation of Migrants of Russia, at least 2.5 million migrants intend to leave Russia in the near future, either to their country of origin or to try to find work elsewhere – in Turkey or the Gulf especially. Regardless of choice, the reality is that Bishkek and Dushanbe are all but assured to lose a significant chunk of their GDP stream. Chinese largesse and investment continue to present a non-Russian alternative for external financing. In Tajikistan, for instance, the extension of the China-Central Asian gas pipeline could create more than 3,000 jobs in the country, though how many will be available for Tajikistan nationals remains unclear. But this work, of course, is only temporary – and will at any rate help only a small percentage of job seekers. And Dushanbe has shown little intuition or inventiveness in providing any form of soft landing for the economic drop that’s just getting underway. 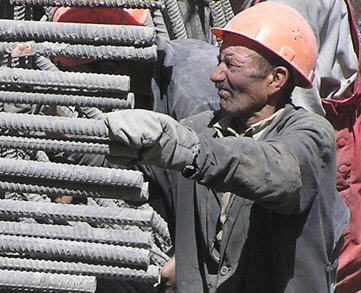 Meanwhile, Bishkek recently announced that the country’s unemployment rate could double due to the country’s coming accession to the Eurasian Economic Union (EEU) – not as a result of Russia’s self-imposed downturn, but because of EEU barriers to the Chinese re-export trade that presented the other notable bulwark of Kyrgyzstan’s GDP stream. And as if the ingredients for discontent weren’t plentiful enough already, southern Kyrgyzstan has just entered its ninth month without gas, with little reprieve set to come. All the while, new numbers coming out suggest that the Kyrgyz-Tajik border is far from placated: The rate of incidents among the largely non-demarcated border, according to Kyrgyzstan’s State Border Service, doubled during 2014. The repercussions of Russia’s economic slide are only beginning to be felt domestically, and are only just now starting to affect Central Asia and their migrant populations. But the prognoses on both ends remain bleak. Economic ramifications are certain; what forms of political reverberation result remain to be seen.